Keurig Rivo Review : Your Rivo Questions Answered! Keurig espresso machine that makes real espresso drinks at home, fast and easily. The Keurig Rivo Cappuccino & Latte System is a complete espresso brewing solution for home use. You can make espresso, latte, cappuccino or iced lattes. The brewer is a bit bulky but works great. On top, there’s a handle and that’s where you insert the Rivo espresso pod. Next, an easy to operate control panel for brewing your espresso beverages (check the ease of use section for details). On the left, there’s a 60-ounce removable water reservoir. The machine works at 15-bar pump pressure, which is ideal for pulling out good espresso shots. Brewing temperature 167 -176 °F is slightly lower than optimal though. What I love about this machine is its built-in milk frother! With this brewer, you don’t have to buy a separate milk frothing unit nor you have to buy milk pods. Keurig Rivo has its own frother and uses fresh milk. Just use the milk option you normally use: whole, skim, rice or almond. For great results, the frother offers three different frothing modes: cappuccino froth, latte froth, and cold froth. The max fill line for the pitcher is 6 ounces. There’s also a small platform that you can open and use to bring up small cups. Auto on/off feature to help you save energy and a pod bin, which can hold up to 10 used rivo pods. Update: The $199 Rivo machine has recently been discontinued and it’s no longer available at keurig. com. You can still find it on Amazon. If you’re looking for a good Rivo alternative, you might like the Nespresso Vertuoline 2in1 coffee maker. Also, Keurig has just released a k-cup machine with a built-in milk frother. It has 3 different frothing modes just like Rivo, but uses regular k-cup pods. Using Rivo is easy and clean – there’s no grinding, measuring or tamping. No matter what your skill level or experience is, you will be able to make a great cup of espresso with this machine. Just take the Rivo pod, insert the pod into the machine, pour some milk in the milk frother unit, press a button or two and in few minutes, your espresso is ready. The Rivo has two cup sizes: 1.4 and 2.8 ounces. That’s like single and double espresso shot on a classic espresso machine. Of course, this is not a final size of your latte or cappuccino. Combined with milk, you get normally about 6 – 8 oz drink. To make a cappuccino, take 1 rivo pod and brew espresso at short espresso setting. Take a milk frother and fill it with milk to MIN fill, close, return to the unit and press the cappuccino froth button. When done, just pour the milk over the espresso. To make a latte, brew 1 espresso pod at short espresso setting. Fill the pitcher with cold milk to MAX fill and press the Latte froth button. Again pour the milk over the espresso and you’re ready to go. And it’s easy to make iced drinks with cold froth option. Of course, Rivo comes with a quick guide/recipe book with 10 recipes to help you make your first beverages. 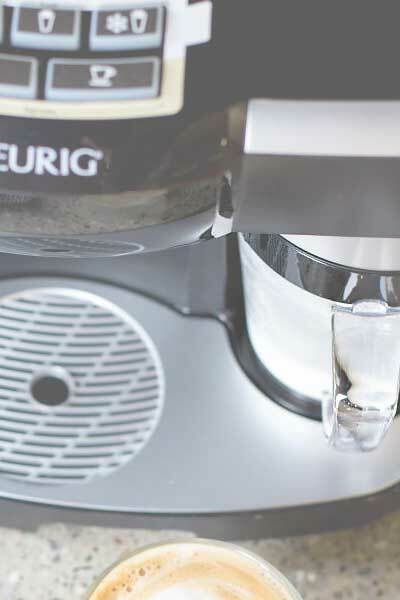 For detailed Rivo instructions, you can download a copy of Keurig Rivo manual online. Keurig teamed up with Lavazza (the company was founded in 1895 in Italy and it’s one of the most important roasters in the world, with 17 billion cups of Lavazza coffee consumed yearly worldwide) to create Rivo pods. They decided not to make a ton of different pods like with their k-cup machines, but to offer only a few quality pod options. Classico – medium roast, sweet floral and fruity notes. Delicato – medium roast, Rainforest Alliance Certified with chocolate and citrus notes. Intenso – dark roast, full body, butter and caramel notes. Decaf – decaf option, medium roast, smooth, citrus and dried fruit notes. Rivo pods contain about 75 mg of caffeine per serving. For low caffeine option, choose Decaf Rivo pods. They don’t make reusable pods for Keurig Rivo, but there are foil seals for Lavazza pods you can use to reuse used pods. Italian coffee capsules (found on Amazon) are the only Keurig Rivo compatible pods at this moment. A 100ct box of italian coffee capsules retails for $35.99 ($0.36 per pod). Can you use regular k-cups in Rivo? Keurig Rivo is not compatible with regular k-cups, Verismo or Nespresso pods. It works only with Lavazza Rivo espresso pods. Does Keurig Rivo make regular coffee? This machine makes only espresso and espresso-based beverages so it can’t do regular coffee or tea. You can, however, craft an Americano, which is a great espresso replacement for regular coffee. If you prefer regular coffee over espresso, classic Keurig k-cup machine would probably be a better fit. If you want a machine that can do both, I recommend the Nespresso Vertuoline. With this brewer, you don’t have to buy a separate milk frothing unit or powdered milk pods. The Rivo has its own frother and uses fresh milk. There are three different frothing modes: cappuccino froth, latte froth and cold froth and honestly, that’s all you really need. Can you use soy or almond milk in the Keurig Rivo? Yes, you can use any type of milk you like in the frother. You can use regular or dairy-free milk. However, you will almost never achieve the same level of froth with almond or soy milk in comparison with whole/ 2% milk. For better result, Keurig recommends to always use cold milk in the frother, and not to use milk below min and above max values. Keurig Rivo best milk to use for froth? 2% milk will give a great froth. But, if you have any allergies, it’s best to use the milk option that you normally use. Your health is much more important than froth volume. Can you use flavored creamers or syrups in the Rivo frother? According to Keurig, adding any other ingredient besides milk – in the frothing pitcher, like syrup, creamer or ice cubes can sometimes damage the machine and it’s not recommended. However, most people use a combination of flavored creamer and milk in the Rivo frother. Personally, I don’t think that creamer can cause a damage to the frother since it has the same texture like milk. I definitely wouldn’t use sugary syrups or ice cubes in the frother though. Also, make sure to clean the frother thoroughly after each use. As I mentioned, the manufacturer doesn’t recommend this so it’s a matter of personal choice and no one can guarantee that this won’t cause a damage to the system. Normally, what happens if that milk was below the MIN line. When using your Rivo frother, it’s really important to not go below the MIN line and not above the MAX line. Keurig Rivo includes a limited one-year warranty for normal home use. Customer service help is available 7 days a week at 866-901-2739. To keep your machine in a good shape clean the external parts or the brewer regularly using a damp cloth and descale it every 3,4 months. The machine will automatically push down an empty pod into the pod bin, once you open the handle. To remove used coffee pods from Rivo cappuccino & latte system, just pull out the drip tray and the bin will come out with it. Clean and dry and place back in its place. Here’s a detailed guide on how to clean/ descale your Rivo machine properly. Water filter for Keurig Rivo?! Keurig Rivo doesn’t use a water filter. Also, the available Keurig water filter (the one for k-cup machines) won’t fit. Keurig just recommends using bottled water in your Rivo. But honestly, there’s absolutely nothing wrong with using regular tap water as long as you descale it regularly. Keurig Rivo replacement parts are available for purchase at keurig .com. Making coffee with the Keurig Rivo is a simple process. It’s the perfect brewer for espresso drinkers, especially ones who want convenience. Keurig has recently discontinued the Rivo platform. You can continue to purchase Rivo pods at select retailers and at Keurig .com. The company expects the Rivo pods to be available for the next three years. The brewer will also still be supported in case customers need service assistance or replacement parts. For more information please contact Keurig Customer Service at 866-901-2739. Hello Barry, the Rivo machine was discontinued in 2016, but Keurig does offer commercial machines. For more info, please visit this this page. Hi Lynn, thank you for the feedback! I have tested the K-Cafe model and I agree with you, having a machine that uses regular k-cups is much more convenient. Although, some don’t like the fact that it doesn’t make real espresso like Keurig Rivo but only concentrated brew. But overall, it’s a nice machine. No, the temperature can not be adjusted. The Rivo brewing temperature is 167 -176 °F which is slightly lower than optimal. The hot cappuccino or latte froth is somewhere around 150 °F, which is pretty much ideal, but when combined the drink temperature is around 165°F, so yes, it’s definitely not steaming. The only thing you can try is to rinse your mug with hot water before you pour the coffee in. This will preheat it and should keep the coffee hot for a little longer. Not sure if this was mentioned already. I barely finished the coffees that came with it and just found out it’s now discontinued. WHAT?! Bed Bath and Beyond used to carry them but they’re took them from the shelf, Amazon is way too expensive, and Lavazza is out of stock. Please offer a full refund/exchange or at least reusable capsules to calm the angriness of some of us who stupidly bought the Rivo last year and can’t use it anymore. I have noticed that the Rivo system for sale on Amazon is captioned “Discontinued” but I can’t find any information directly from Keurig about this. Do you know any rumors of them not making the Rivo any more? I might buy an extra one just to keep. there’s no official announcement, but according to official Keurig Facebook Page, the Rivo system has been discontinued. Oh no! That makes me sad. I have used mine for 4 years and only had to replace the frother cup but I guess eventually I will have to switch to something else. What would be your next best choice for making lattes from pod espresso machines? The pods will still be available to purchase online. They’re currently out of stock at keurig .com, but I’m sure they will be back soon. They are also available at Bed, Bath & Beyond and Amazon. Keurig now has a subscription option, you might want to check that too (up to 15% off when you sign up for auto delivery). Starbucks Verismo machine is really popular because of the brand, but I don’t think it’s really a high quality option. But you can get a machine and a frother on sale for only $98.00 right now! My favorite choice would probably be the Nespresso VertuoLine. It makes both, brewed coffee and espresso and makes the best foam ever. Although, it doesn’t have the built in frother but separate frothing unit. When on sale, you can get machine + frother for about $150.00. You can read more about Nespresso VertuoLine here. All the best! I have both a Verismo and Rivo. The Verismo is nothing compared to the Rivo. I’m sad they discontinued the Rivo and will stock up on pods. I fear they will be hard to find in the very near future. I hope they plan or giving the people who bought this maker their money back when they no longer make the pods. They have been out of stock at Keurig for some time. I’m with you. I have been PISSED for months now. No warning, nothing. Last I saw was “sometime in Feb” they’d be back in stock. So I guess I have a $229 brick on my countertop now. Good luck finding pods online for even close to retail price. This isn’t right at all. I also have a Rivo machine that I bought about nine months ago. I just now called Kuerig and spoke to someone named Stephanie in their customer service department . She said that they were not planning and refunding people their money and that we were just basically out of luck. In fact she had the nerve to offer to sell me another machine at a “discounted price”. So instead of keeping their customers happy they’re just trying to make more money off of us. This is not a company I will deal with in the future. I guess I need to find a different coffee maker. That’s too bad because I really like my Rivo and I used to tell everyone how good of a machine it was. Very disappointed in Kuerig. I don’t understand why they can’t they order the decaf option, but if they say so… If you can’t find the pods anywhere in your area, buying online is a great option. I recommend to register at Keurig .com because they often have very nice sales and they now even have a subscription option. If you’d like to stock up, now is the perfect time because there’s a sale at Keurig .com – 20% off sitewide + free shipping (through 12/18). The Intenso and Classico are out of stock, but they still have the Decaf and Delicato, if you hurry up I’m sure you can find them. The price for one box is $12.99 and with 20% off it’s only $10.39, shipped free. It’s a sitewide sale so if you need to buy anything else, like k-cups or anything it’s a great chance to save. Use code SHOPANDSIP. hello, I just got the Keurig-Rivo, the pods seems not to be very popular, which other capsule can I use with the expressor machine I have bought no name coffee pods and president but they seem not to both fit into the pod space. the Keurig Rivo system works exclusively with Rivo Lavazza espresso pods. The machine is not compatible with any other pod type/ brand. They also don’t make a reusable Rivo pods. However, the Rivo pods are really nice and are made with quality espresso coffee (the Lavazza company was founded in 1895 in Italy and it’s one of the most important roasters in the world, with 17 billion cups of Lavazza coffee consumed yearly worldwide). As I mentioned in the post, Keurig decided not to make a ton of different pods like with their k-cup brewers, but to offer only a few quality pod options. So, even there are only 4 pod types, I’m sure you’ll find one that fits your taste. All of my readers use original pods and are really satisfied with them. If you like really strong coffee, I recommend the Intenso pods, Classico and Delicato if you like medium roasts, and there’s also a Decaf option if you need decaf espresso. I think the pods were on sale at Keurig.com that’s probably why they are out of stock. But you will find them at Bed Bath & Beyond (online and in stores). You can also purchase them from Lavazza online store and from Amazon, but please check prices because they are sometimes overpriced (regular price for 18ct Rivo pod box is $14.99, or $0.83 per pod). I hope this helps. Also, Keurig now has a subscription option you can check that too and get the best prices. Also, don’t forget to register your brewer at Keurig website, for some extra offers. Sorry for the late reply Cindy. Please empty the pod bin and make sure there’s no pod stuck in the machine. If the bin is full it can sometimes cause this. If everything seems fine but you’re still having problems with the handle or it now feels broken, please call Keurig customer sevice. Regular Rivo pods contain about 75 mg of caffeine per serving. I just got mine, and it did not come with any sample pods. Also, the drink seemed a little cool. Even though the milk added to the frother was cold (as directed) I thought it would heat it up so I would have a steaming hot drink to take with me to work. The Rivo brewing temperature is 167 -176 °F which is slightly lower than optimal. The hot cappuccino or latte froth is somewhere around 150 °F, which is pretty much ideal, but when combined the drink temperature is around 165°F, so yes, it’s definitely not steaming. The only thing you can try is to rinse your mug with hot water before you pour the coffee in. This will preheat it and should keep the coffee hot for a little longer. I’m surprised that you didn’t got any samples, because they are almost always in the box. That’s probably because of the retailer because they decide what they will include in the offer. It seems they no longer sell them at Keurig.com. I couldn’t find them on Amazon neither, I’m sorry. What flavor do you like the most? I think you can get the same (or probably even better ) result with Torani or Starbucks syrups/ sauces. And the bottles are much bigger so they will last longer too. I tried them on my Rivo. They taste better (to me) and cost less and there’s plenty of supply. My rivo wont puncture the pods and the water just flows into the drip resevoir. Is there a way to fix it? If this happened just once or twice then there’s no reason to worry, this can sometimes happen for no reason. Make sure that the pod have been inserted correctly and that used pods bin is empty, that’s important. If both seem fine but Rivo is still not puncturing the pods, I recommend to call Keurig customer service for further instructions. 1.866.901.2739. Good luck! Did you find a way to fix this? I’m having the same issue…. My Rivo machine has to be unplugged, once plugged in water sprays crazily out of frother while beeping and clicking commence, problematic since I got it. My comment keeps getting removed! What a rip-off!! Hi Suzy, I’m sorry that you’re having troubles with your machine. Have you called Keurig customer service (1.866.901.2739.) ? They are usually very helpful, maybe you can try calling them directly instead through FB page or similar. That definitely sounds like a broken machine. I have a Rivo machine and I was wondering if I just want a hot cup of water and I use the technique of water cleansing for the machine just to brew water will that ruin my machine ? I want to know why there is quite a bit of water in tray after using the Rivo. Hi Cindy, the machine will always dispense some excess water from the brewing process. It’s just how the machine works and it’s completely normal. But if it seems like there’s always too much water (for exmple you need to empty the drip tray after every 3 cups) or there are any unusual leaks, you can call Keurig customer service to help you troubleshoot your machine. I have two Rivos. The first one I bought and found after use it a few times the water reservoir was full of water and coffee. I call Keurig and ask them about it they sent me a brand-new machine. When I got that second machine it did the same thing I called Keurig back told him about it they had no answers. so after two times of making 2 cups I have to drain the water under where you set the cup. This is so annoying I feel like going out and buying another brand. I don’t want to throw my money away what does somebody recommend. I’m sorry that you’re having issues with your machines Annie, I know how you feel :( and I understand why you want to switch to a different brand. If you’re looking for a single serve espresso system, the one that uses pods, you might want to check out the VertuoLine system from Nespresso https://coffeestylish.com/nespresso-vertuoline/ . It’s within the same price range but offers better quality plus it can do both, regular coffee and espresso. I just got our Rivo espresso maker at Xmas. Seemed to work well and taste good, no issues. But yesterday and today I inserted a rio cup and the top pops up when making espresso , Tried it three times, all the same with different rio cups. Put it in, it starts to make espresso and then the top slowly pops up and coffee maker stops making espresso. What is the issue? Hi Edith, make sure the handle is well closed (which I’m sure you already did) and empty the used pods bin. If everything seems fine but the handle still won’t close/stay closed then I recommend to call Keurig customer service to help you troubleshoot your machine. When I brew a new cup, there are tiny pieces that look like ground espresso in my drink. Why is this happening? I only use the recommended Lavazza pods. Hi Miranda, with this type of machines, some very small amount of grounds at the bottom of the cup is normal. But, they are usually very fine and they don’t mess up the coffee taste/ texture. That’s just the way it is. But if you’re getting a really messy result or bad cup of espresso, then you can call Keurig customer service at 866-901-273, to help you troubleshoot your brewer. I hope this helps. My frother isn’t steaming the milk so it’s still cold after the cycle is completed. Hi Karen, if you use a regular (not cold froth) button, then the milk should always be warm. Since that’s not the case, you should call Keurig customer service and ask them to help you troubleshoot the machine. Please let me know how it went. Thanks for your help! I will call the number you included…really love my Lavazza! Hi Christine, if this happened just once or twice then there’s no reason to worry, this can sometimes happen for no reason. Make sure that the pod have been inserted correctly and that used pods bin is empty, that’s important. If both seem fine but Rivo is still not puncturing the pod, I recommend to call Keurig customer service for further instructions. 1.866.901.2739. Good luck! Hi Mary, just pull out the drip tray from the machine and the bin will come out together with the drip tray. QVC has an offer that includes, I think, like 30 pods with the Keurig Rivo for $149 plus shipping. And they will let you break the payments down in 5 monthly payments on your credit card. If you’re wanting to get an espresso/cappucino/latte machine without having to shell out all the money at once, this is a great option. Just go to qvc.com and search for Keurig Rivo. When I use the froth/steamer it makes a thumping noise.. is that normal? Hi Alyssa, the banging noise is normal during the frothing cycle. If the fother is working properly, then everything is ok. Of course, you can always call Keurig customer service for more info 866-901-BREW (866-901-2739). The metal brewing handle on the top of my Keurig Rivo machine is not closing completely. There are no pods/cups in the discard bin. Even without a pod in the brewer, it still will not close all the way. If I push it closed, it will pop back up. Does anybody have a fix for this? Hi Jason, you can try removing and placing the rivo pack bin & drip tray again. Just in case, to see if it’s placed properly. Sometimes, the handle won’t close if the rivo pack didn’t fit well, so you need to lift the handle, adjust it and close it again. If everything seems fine, the bin, drip tray and the pod looks fine and are in the right place, but it still won’t close like it used to, then it’s best to call keurig customer service and ask for instructions. 1.866.901.BREW (2739). Good luck! Let me know if you need anything else. HI, We have only had our machine for two weeks and it has been working great until today. I have been using Almond milk and it has been frothing great until today. Milk is cold, and have cleaned machine. Can I take back and get a replacement. Hi Bridget, I’m sure that Keurig customer service can help. You can contact them at 1.866.901.2739. Good luck! Can I get a replacement for the Cappuccino, Latte, and Cold Froth steam top for the Rivo that sits on top of the milk cup? I hope you found your cover. My cup chipped,but the replacement cup has been out of stock for several weeks and I can’t find another source than Keurig. BTW, I love my Rivo and recommend it. It can be a little finicky with th steamer. Just be patient and adjust the lid. It needs to sit just right, then there shouldn’t be any knocking . I am on the third Rivo and have four frothing pitchers and still unable to froth milk for a Latte or Cappuccino. Any new suggestions? I’m sorry Janet. If your machine is working now, but you only have a problem with the pitcher, you can try this. Check to see if the rubber stopper is all the way up or in contact with the lid. There must be a space between the lid and the stopper, so slide it down a little bit. That should solve the problem. Also for the best result, I recommend to use whole or 2% milk. I’m sorry that you’re having issues with your machine Dan. Descaling can sometimes help, you can try that, but there’s a huge chance that your machine is broken so I would first call customer service, before trying anything. I think there’s a better chance for a replacement/service/proper troubleshooting this way since it’s clear that’s it’s because of the machine and not because of the user (wrong service or use). Keurig Customer Service is normally really good so I’m sure they will help. They are available 7 days a week at 866-901-BREW (866-901-2739). Good luck! try steaming the entire water sump with 1/2 cup of white 5% vinegar through the maker. My frother does not heat. The milk froths beautifully but remains cold. Suggestions? Out of warranty. Hi Maureen. If you use a regular (not cold froth) button, then the milk should always be warm. Since that’s not the case, you should call Keurig customer service and ask them to help you troubleshoot the machine. Their customer service is usually very good and I’m pretty sure they can help. Please let me know how it went. Good luck! If I had known that I was forced to use their Lavazza cups I never would have bought this machine. I may put it out on ebay for sale. I only use organic and I prefer my own coffee and you are stuff using their proprietary coffee. $200 down the tubes!!! I was having the issue of the pods not puncturing and it turned out that the cause was due to a over filled waste bin full of used pods that caused the silver handle to miss align with the cog and gear system that controls the puncturing mechanism. To fix this I took the top off and disconnected the two white water lines that go to the unit in the front of the unit then I unscrewed the 4 screws that hold the puncturing mechanism in and you have to pull the handle up to get it to come out. Then undo the screw on the black gear on both sides and align the unit to fully closed and then put the gears back in and tighten screws then open sliver handle and tighten with Allen key and wrench the nut that holds the sliver handle to the puncturing mechanism. After you put back together remember to always take out the old used pods after use and make sure they get ejected and don’t jam in between the bottom of the pod holder and waste bin. Hope this helps everyone. Mine works great now. Thanks for this post, Michael! I was having same issue and was ready give up & throw my unit in trash. Luckily, I tried your instructions in a last-ditch effort & it worked! Good as new!!! I got this machine for my parents this past Christmas and they are having issues with the frother. When they use the cappuccino froth, it comes out cold. When they push the latte froth, it comes out hot, but then water starts to leak from the coffee part of the machine while it’s frothing. There is also a lot of steam everywhere. It is still under warranty, but they do not have the box. Any ideas? Thanks! I have water leaking into the frothing pitcher. this makes no sence at all. I’m sorry that you’re having issues with your brewer Debbie. Is your brewer still under warranty? I would call Keurig customer service to help you troubleshoot your brewer. It’s normal for water to leak a little bit from the nozzle after it’s done brewing, but having water leaking into the frother sounds like there some kind of a leak inside the machine . If there is water inside the machine it can eventually burn down electronic parts or damage the cables. None of my readers have had this problem so I can’t say for sure. I recommend to call Keurig customer service and make sure if the machine is not broken or needs to be replaced. Good luck! Keurig customer service: 1 866-901-2739. It is not under warranty anymore , and i did call customer service they never heard of anything like this and only wanted to sell me another machine. My bad luck i guess. we bought it used it two months. It was in storage for a year while we build our home. And now no longer under warranty. My machine is about a month old and now won’t puncture the pods to make my coffee? What is the problem? I love my Rivo, so much faster, less mess and a consistent taste. Here is my question, since I got my Rivo, I have faithfully emptied the used pods putting the grinds in my garden. Then I remove all the foil, wash both the foil and plastic pod. I was hoping to recycle and then was told “no”. Surely there is a way to recycle when the pods are emptied????? And these hot summer days, try an iced espresso or latte with Sambucca. I normally do not drink but this is good! When I make the latte I place it in a glass and I can get the three layers, coffee, milk and foam, the layers are attractive and a slow undulating goes on as the layers mix. So attractive and tasty. My Rivo when turned on this morning started making a loud high pitched noise and will not turn on. I had to unplug it to get the noise to stop. Any suggestions? I’m sorry to hear that Janice. Check if there’s enough water in the reservoir, if the frothing unit is placed properly, and also empty the pod bin. If everything seems fine and the machine still won’t work after this or is still making noise, then it’s best to call customer service. Keurig Customer service help is available 7 days a week at 866-901-BREW (866-901-2739). Please let me know how it went. Thank you and good luck! I have had my RIVO for about three months and today I noticed a pool of coffee-water leaking from under it. When I moved it to clean, I found that it was quite a bit of liquid and it had seriously damaged the counter top…to the point where it is going to have to be replaced! The linoleum appears to have been so hot that it bubbled! This can’t be safe! I clean the tray daily, so this is not the problem. My keurig is making a banging noise when i froth and steam the milk how do i fix the noise? I am also having this same issue. I just received the Keurig Rivo in the mail today. I ran all the cleaning procedures during set up. Afterwards I had this banging noise coming from the back of the machine (by the frother) while making my beverages. I have never owned a Keurig but from the tutorial videos I have seen this did not happen during it. It did say in the set up instructions that during the cleaning cycle the machine would be louder but this noise happened afterwards so that is why I am concerned. I am hoping I did not get a defective machine. Please let me know if you have any ideas of what this could be. Thank you! Hi Gretchin, in my opinion, any weird noise coming from the unit is not ok. I would call customer service just in case. Keurig Customer service help is available 7 days a week at 866-901-BREW (866-901-2739). Please let us know how it went. Thank you. All the best and have a great weekend! Update: I just got reply from Customer Service. According to Keurig, the banging noise is normal during the frothing cycle. If the fother is working properly, then everything is ok.
For my Keurig RIVO I am also hearing banging noise when I froth milk. I called Keurig customer service and I was told that it is NORMAL to hear this banging noise. I am wondering if others also got the same feedback/reply from customer service folks. Any help will be appreciated. The banging noise is normal during the frothing cycle, It is the steam generator. If it performs its functions I would not worry. I love my RIVO. I have one observation. The first brew is not as hot as subsequent brews. I imagine it has to do with the time it takes to heat the water. BUT, it only stays on for two minutes if there is no activity. How can the unit stay on longer?? Or can anyone address this issue? Thank you! Hi Sean, as you’ve said, the brewer shuts off automatically after 2 minutes and unfortunately, the auto off feature can’t be disabled. Now, normal brewing temperature for the Rivo is 167 -176 °F, which is slightly lower than optimal temperature for espresso. What you can do maybe is to run one lungo button without inserting the pod (when you turn on the unit), discard this water from the mug, and then make espresso using Rivo pod like you normally would. This will give you some time to heat up the water to desired temperature and your first shot won’t taste cold. That’s the only thing I can think of right now. I hope this helps. Thanks for stopping by and sorry for waiting so long. All the best! Are the coffee pods recyclable? Hi Kathleen, unfortunately no, Rivo pods are not recyclable. With my Rivo the pod spits out grinds while making expresso. Any solutions? Hi Laura, with this type of machines, some very small amount of grounds at the bottom of the cup is normal. But, they are usually very fine and they don’t mess up the coffee taste/ texture. That’s just the way it is. But if you’re getting a really messy result or bad cup of espresso, then you can call Keurig customer service at 866-901-273, to help you troubleshoot your brewer. I hope this helps. Hi Michael, you can download your copy here. All the best! Hi Tina, for some reason, Rivo machines can sometimes have problems with the milk frother. One of the readers Dave has a smart solution: “For anyone having issues with the frother Karen pointed out what may be causing your issues. The second or third time that I used it I figured that it would be better to push the rubber stopper all the way up so it was in contact with the lid. If you do that it actually prevents the wisk from spinning at all. You’ll get warm milk, but that’s it….and it may make a funny grinding sound. Slide the rubber stopper back down the shaft that the wisk is on, then slowly slide it up….there is actually a little indent that it is supposed to sit it. And there should be a gap up about a quarter of an inch or so between the stopper and the underside of the lid. Since figuring this out we haven’t had a single issue with our Rivo, and we use it a lot.”. I hope this works for you too. If not, then you can contact Keurig customer service for instructions. 1.866.901.BREW (2739). Good luck! Hi Tiffany, I couldn’t find this information neither. Normally, 1 shot of espresso has roughly 50-75 mg of caffeine, so Rivo pods caffeine must be somewhere around these numbers. I will contact Lavazza and will let you know as soon as I have some info. Until then, I recommend to try their Decaf Rivo pods, because they do have this option. Im wondering if the caffeine content in the Lavazza Rivo pods has yet to be published? Hi Jess, Lavazza Rivo pods contain about 75 mg of caffeine per serving. There’s also a Decaf Rivo pod option, with lower caffeine levels. I hope this helps. Hi Tiffany, I got a response from Keurig: Rivo pods contain about 75 mg of caffeine per serving. So, that’s that average amount of caffeine for espresso (50-75mg). I hope this helps and sorry for waiting.Have you tried the Decaf Rivo pods? Any better? All the best! Thanks for your response – you’re awesome!!!! I bought my son a Christmas gift. The Rivo, and everything seems to work fine except it does not pump the water out. The frother works. It indicates that the reservoir is empty. We’ve tried everything to fill it completely and fill it half way. rinsed it out over and over again. We were all excited to try it out and still are unable to get it to work. Sorry to keep you waiting Shannon. That’s a lovely gift and I’m sorry that you’re having issues with your machine. Since you’ve done everything correctly, then there’s something wrong with the machine. I would contact Keurig customer service (1.866.901.2739.). All the best and Happy New Year! My Rivo sat unused for a few weeks. Now, it won’t brew. No water is getting sucked into the tubes. What do I do? Hi Sarah, I’m sorry to hear that. If the water reservoir is full, everything is in place and the machine is turned on, but still not working, you can try and unplug the power cord. Then, plug the power cord back again. Press the Power Button on the right side of the brewer and wait for about a minute. After that the control panel should flash and you should hear a beep. If everything seems fine, you can run the cleansing brew first (press lungo button without inserting the pod), and make your beverages after that. I hope this works. If not, then it’s best to call Keurig customer service to help you with troubleshooting. I hope this helps and let me know if you need anything else. Do you know if I have to brew 4 single shots of espresso in the Rivo to equal the 4 espresso shots I get in a coffee shop drink or can I just use 2 double shots from the Rivo? I don’t know if running 2.4 oz of water through the 7.5 grams of grounds in one cup is just watering down a single shot or if this is how double shots are made at a coffee shop. Hi Adam, normally, double shots are made from 14-18 grams of coffee, and singles from 7-9 grams. With that in mind, if you want an ideal result you will need 2 pods at single shot setting to get a double shot (4 pods for 4 single shots in this case). But, honestly, I think that 2 pods at lungo setting will give a nice result too. It really depends on what drink you want to do and how strong you want your espresso to be. Just play with both options and choose the one you like more. I hope this helps and sorry for the late response. Thank you, that does help. Just received the machine today and will play around with options to see what I like best. I’ve had my Rivo for just over a year and have loved it. But suddenly the power isn’t working. The lights still come on, but then they go out, so it is a strange issue. Has anyone else had something like this happen? I’ve just passed my warranty expiration, so I don’t know what to do since I can’t use it. Staples carry them as well. Hi Tim, yes, you can do vanilla cappuccino with Rivo and it’s really simple. You will need 1 rivo pod, milk and vanilla syrup or vanilla french creamer. 1. pour cold milk to MIN fill, place the pitcher and press the cappuccino froth button. 2. when done, put 1 tbsp vanilla syrup/creamer into the cup, place it on a drip tray and brew 1 rivo pod at short espresso 1.4oz setting. 3. when done, just pour the milk over the espresso. If it’s easier you can use separate cups, just put the ingredients together in this order: syrup/creamer on the bottom, then espresso, then milk froth. Enjoy! My Rivo has 2 pods stuck in the back that won’t drop into the bin. How do I get them out? Hi Marsha, can you get out the pod bin? Is it empty? First, I would try removing the pod bin/ drip tray from the rivo. Then, if the pod is stuck in the brew head you can carefully try moving the pack with your fingers to release it. Or you can try reaching the pods from the bottom once the bin/drip tray is removed. You can also use some not-so-sharp knife or a similar tool. Something to reach and jiggle the pods, but not damage the machine at the same time. I’m sure you can get them out, just be careful, especially if using your fingers and don’t forget to unplug the machine first. ps. If this doesn’t work, you can try and contact keurig customer service for instructions. 1.866.901.2739. Let me know how if everything went well. Good luck! Thank you for the suggestion. I used a long handled hook for clearing jams in my embroidery machine. With that I could hook the pods and pull them out. Couldn’t get enough grip with my fingers as they were too far in. Thanks for the help. I am having this very problem right now. Now I can’t even see the disappeared pod, so I’m not sure where to poke at it to prod it out. My Rivo won’t snap close anymore. Do you have any suggestions to fix this issue? Sorry to hear that Jason. Sometimes, the handle won’t close if the rivo pack didn’t fit well, so you need to lift the handle, adjust it and close it again. Also, you can try removing and placing again the rivo pack bin & drip tray just to see if it’s placed properly. If everything seems fine, the bin is empty, drip tray and the pod looks fine and are in the right place, but it still won’t close, then it’s best to call keurig customer service and ask for instructions. 1.866.901.BREW (2739). Good luck! Let me know if you need anything else. Hi Patty, yes you can download a copy here. Enjoy! I have recently started noticing grinds in my coffee. How can I fix this? It is not a small amount, and it ruins my coffee. Is there some way to clean it? It wouldn’t be a bad idea to try descaling your Rivo. The process is very simple and it helps to remove build ups and grounds from brewer components. It’s recommended to repeat this process every three to six months to keep machine in a good condition. For descaling you will need a special Keurig descaling solution ($12.99 recommended product to use by Keurig), but really, you can use a simple white vinegar. And here’s a video with descaling instructions: http://www.youtube.com/watch?v=0E1zSVdxiPs . I’m sure it will help with this problem. I hope this helps. Let me know if you need anything else. My rivo is not puncturing the cups. How do I fix this? Hi Shelley, sometimes, the rivo pack may get stuck, and that is normal. But, if the pods gets stuck continually (even though the pod bin is not full and everything seems fine) then the needle may be defective. In that case, it’s best to contact Keurig customer service at 866‑901‑BREW (866‑901‑2739). All the best! My Revo a year old leaking water…. Why?? I’m sorry that you are having issues with your Rivo Suzzanne. I don’t think this is something that you can easily fix, so I think it’s best to call Keurig customer service at: 866-901-2739. I hope they can give some “official” instructions or maybe even offer to send a replacement. Good luck! Hey i have found a problem with the Rivo. It seems new so i figured i would let it be known. Anyway the thing started leaking. My dad took the whole thing apart and we found where the water was leaking from. Its coming out of a spot directly behind where its suppose to come out. You cannot see it unless it is taken apart. I understand its suppose to leak a little bit but it overflows with the first cup of coffee that i make. Why is it leaking so much back there?? Reuse the pods with the coffee if your choice. There’s always a way to to beat a monopoly. Cover the used pods with tinfoil. Also, I was disappointed with the temperature at first. Now I steam milk twice and lattes or are perfect. I really wanted to buy this product but am not since there are no Keurig Rivo reusable cups. Are there palns to make reusable cups in the future? I have espresso grounds in every cup? Hi, with this type of machines, some very small amount of grounds at the bottom of the cup is normal. But, they are usually very fine and they don’t mess up the coffee taste/ texture. I would run a cleansing brew just to make sure there are no coffee grounds in the internal components. I don’t know if you have a manual, but just in case: place a mug on a drip tray. Run an espresso lungo button without inserting the pod and when the process is complete, discard the water from the mug. You can do this once or few times if you like. If you’re getting too many grounds in your coffee and poor drink quality, then I suggest to call Keurig customer service at 866-901-2739 and see if they can give you some new instructions. I hope this helps. Good luck and let me know if you need anything else. You can try removing and placing the rivo pack bin & drip tray again. Just in case, to see if it’s placed properly. Hi Alicia, did you ever get this fixed? mine just did the same thing!! I did get the issue resolved! I called the Keurig company and they were so helpful. I explained the issue and they sent a brand new machine within the week. I put the broken one in the box and shipped it back. They said this issue has been happening with not only me so they wanted to inspect the faulty machine. Good luck with yours!! Not sure how long this will be in QVC, but they have the RIVO for $199 + your sales tax and about $14 shipping. The deal is, this package includes 36 pods (instead of usual 12) and a pod carousel (usually $20-30 more). I got the rivo yesterday and love it. My only small issue is it does not brew piping hot. I like very hot so I have to sip first, then drink. You can drink right away. I did preheat my milk which helped some. Has anyone used the same pod to brew a second shot immediately? Was it strong enough? Hi Amanda and thanks for the feedback, I’m so glad you like the machine. I haven’t tried it myself, but you can give it a try. However, I think it’s much better to get out the pod first and then add more water (lift the handle and close it without inserting new rivo pod, and then use single or double espresso shot once again). It really depends on what type of beverages you like. For latte and cappuccino, 1.4 oz and 2.8 oz are pretty good sizes to start from. If you like espresso taste but you like big cups, Americano is perfect. In a mug, brew espresso using lungo button 2.8 oz, and just fill the rest of the mug with hot water. It’s super simple. I hope this helps. Thanks for stopping by and enjoy your homemade espresso. My husband gave me this machine for Christmas, before that I used a regular espresso machine. So far I am LOVING it, especially when we have people over and I need to make several drinks. Before, it would take me at least half an hour to make four drinks. I love not having such a big mess every morning on the counter. I used to love Starbucks coffee, and at first I wasn’t sure about the Lavazza capsules but after trying all of them, I love the delicato variety the most. It brews a perfect shot of espresso topped with lots of crema. It reminds me of the wonderful lattes I get in France, a little smaller than I was used to making but a good reason to have two. One of my favorite features now is the cold froth, I usually like to make an iced latte in the afternoon and the cold frothed milk adds such a wonderful decadent creamy texture to it. I am addicted and I find that I miss my machine whenever I travel. I recently stopped at a Starbucks to get an iced latte and I could not hardly drink it. The only downside so far is that I am drinking way more coffee. I just received my Keurig Rivo today and already tried all the recipes in the recipe guide that came included with the machine. Where can I find more recipes? Hi Belen, well they only have those 10 recipes in the the Welcome recipe guide. Do you have a specific drink in mind, maybe I can help with the recipe? If you like you can check out my recipe index page here https://coffeestylish.com/coffee-recipes/ and see if there’s a recipe you like. You can make most of the drinks with the Rivo. Let me know if you need anything else or some help with the recipes. I just bought the Rivo machine and I can not wait to receive it. I already own a keurig k cup machine. Will the new rivo cups store in my current k cup storage units? I have 2 stand up holders and a drawer for my k cups. Wow, I’m so excited for you Dacia, Rivo is a great machine. As far as pod holders, the rivo pack are much smaller than k-cups, so it wouldn’t be a surprise if they don’t fit. But, I think you will be able to use at least one of the models – probably the drawer, if not all three. I can’t say for sure since there are so many different holder/drawer models out there. Keurig have a special designed Rivo carousel ($29.99 http://www.keurig.com/accessories/rivo-carousel ) but I would wait until I see how they fit those you already have. ps. I don’t know if you have some old glass jar or bowl, they also look good with the pods inside. Let me know if you need anything else. Enjoy your homemade espresso, and have a very blessed and happy holidays. PS – Danjela – I also had the frothing issue (little to no crema – mostly milk). Thanks for passing on the tip about the rubber plunger on the whisk. Awww Tammie, you are amazing…thank you so much for your feedback and all the info. I’m so glad you’re satisfied with the Rivo and that I was able to help. Thank you! Enjoy your espresso drinks and have a very blessed and happy holidays. I also the fact that the machine works fast and seamlessly. Touch the on button, wait a couPle seconds for it ti warm up, pop a pod, hit a button and the delicious aroma of freshly brewed espresso begins to waft through the air – go to my fridge, pour a little milk in the fritter cup, insert, hit a button, couple seconds later I am pouring a rich cream and frothy milk into my espresso. So in under 2 minutes, I am in latte heaven. I also love the versatility – you can vary the flavors, strength (1, 2, 3 shots of the same pod), and the type of drink (cap, latte, iced, hot, even Americano coffee). the options are limitless, bc RIVO has done an excellent job prodding the basics that are easily mixed and matched. The espresso itself is outstanding. It’s smith and rich. Its not bitter. Abd I don’t get that ‘coffee buzz’ like w some coffees that can cause a spike in energy and make you irritable. I also love the money savings – if you buy the 18 ct box at BBB w/$5 off coupon, cost is $10. That’s roughly 50 cent a cup for a latte VERSUS $3, $4, or $5, depending on where you buy your brew. With this savings, I figure the RIVO machine will pay for itself in a short time. Instead of feeling that ache of my pocketbook being drained each time I get a latte, now I feel Iike I am saving money each time I sit down and enjoy a delicious latte – in my pajamas! I recently read some articles about a ‘throw down’ between *bucks, McD’s, and Dunkin Fonuts on pumpkin spice lattes this fall. IMHO, I believe the more people find out about the RIVO, the more people will quit the ‘big 3’ latte sellers. Love your blog – thanks! I just bought the Rivo espresso machine last week bc I got tired of running out to get a latte every morning in the cold. (I work at home). OMG!! Was this ever a GREAT investment. I bought the Rivo at Bed, Bath, Beyond w/a 20% coupon, bringing cost to about $185, 190-199 w/tax (sorry, don’t remember to the penny). Hi Danijela, I love Starbucks & Nestle Nescafe which is the company that sells the Nespresso. I am looking to purchase my first brewer/espresso machine for myself this xmas. My only doubt which keeps me from making up my mind is that I NEED/WANT the Milk frother no matter what machine I get but I’m worried about all of them made of plastic and none but the Verismo 600 show mention that at least the water tank is BPA-free. Do you know of if the Keurig or the Nespresso have a BPA-free option? Thanks in advance for your time =). All these machines works good, so you will have a great cup of coffee no mater which one you choose. According to Keurig, both Keurig Rivo pods and the machine ARE bpa free and do not contain any phthalates (you can read pods faq and Rivo machine faq), which is great. As you already told, the Verismo machines are bpa free (both 580 and 600 model). Now the Verismo uses special milk pods, which no one ever buys since they taste pretty bad. So, you’re completely right, the frother and fresh milk are a much better choice even if you get a Verismo. But, I would suggest to skip their frother and get a different one since it’s not very durable. And now, the Nespresso. The Nespresso uses aluminium capsules and they are coated with protective film to prevent any contact between the aluminium and the coffee, so you don’t have to worry about them. This information about the machines is simply impossible to find. It took me two hours, reading manuals and user guides and what not, and finally I had to send them an email. I will let you know as soon as I get a reply from them. I guess this is really important to you so I want to help. Danijela, I really appreciate all your help & time =). I’ll wait for your info on the Nespresso before I make my decision. Thank you again for the help. You’re welcome! I just got the mail from Nespresso and in short : it says that Nespresso machine water tanks contain no trace of Bisphenol-A and made using styrene methylmethacrylate copolymer (SMMA), which is approved for use. The only machine/part that contain BPA are external milk jugs on their Lattissima machines. I think these are great news, since you can choose among all other models plus use their frother. I hope this helps. I’m sure you’ll choose the best machine for you home. All the best. I have issues with my rivo brewing less and less espresso each time that i use it. Any idea how to fix this problem? It's so hard to find any FAQs on the rivo. But I love it!!!! I’m sorry you’re having these issues with your machine Lindsay. I can’t say for sure, but I would first run a cleansing brew just to make sure there are no coffee grounds in the internal components. I don’t know if you have a manual, but just in case: place a mug on a drip tray. Run an espresso lungo button without inserting the pod and when the process is complete, discard the water from the mug. That’s it. And, if this doesn’t help, I suggest to call their customer service. In fact, you can try the cleansing brew, and call the customer service before you try descaling the brewer, just in case ;) . You can give them a call at 866-901-2739 or send them an email http://www.keurig.com/customer-service . I hope this helps. Good luck and let me know if you need anything else. Thanks for stopping by! Rivo is now available at Kohls. $249 but with a 30% off I got ours for $175. Gift for my wife’s birthday. any idea what size cups to get for cappuccino and latte? I got 3 oz espresso cups. Wow, that’s a lovely gift John. And, I love the price! As far as the cups, well, it depends on what you like. Because you can serve a latte/cappuccino in 8 oz or 16 oz cup. You don’t have to follow some strict rules. Personally, I love 12 oz cups. They are not too large, but you can still stir your coffee without making a mess. I think it’s great size no matter if you’re making your latte/cappuccino using short espresso or espresso lungo setting. And they look pretty good, too. In fact, I think that Keurig recommends 12 oz cup too for the Rivo cappuccinos and lattes. I hope this helps. PS. I don’t know if you got a recipe book with your machine, but just in case you need one, you can download one online. Have a great week and let me know if you need anything else. Cheers! Great information…Thank you :-) Any word if QVC will be carrying the RIVO? Thanks Chanah. Some say they might start carrying the Rivo around the holidays, but I can’t say for sure. I will keep you updated. Let me know if you need anything else and have a great week. Help. I love my Rivo and now when I close the lever and press the button, half the water pours into the drip pan. It’s 14 months old so I can’t send it back… Thanks. Hi, descaling your machine can sometimes help so you can try that. However, it sounds like a more serious problem, so I would first call Keurig customer service (1.866.901.2739) and ask for instructions. Their customer service is normally very good and I’m sure they can help even if the machine is no longer under warranty. That’s why I wouldn’t try fixing it on my own or anything – you’ll have a better chance of getting a service or maybe even a replacement this way. Good luck and please let me know how it went. I think they are design to go bad after 1yrs, this is the second machine and the same the happen to me both times. I’m sorry that you’re having issues with your machine. Please call Keurig customer service at 1.866.901.2739 to help you troubleshoot your machine. Thank you. I was lucky enough to order one of the Rivos from keruig .com when they were still shipping to Canada….they won’t ship to Canada any more and it isn’t available on Rivo .ca yet. Regardless, we love this machine. It works great and we have the Intenso and the Decaf pods so we can treat ourselves any time – and it brings back great memories of our recent trip to Italy. For anyone having issues with the frother Karen pointed out what may be causing your issues. The second or third time that I used it I figured that it would be better to push the rubber stopper all the way up so it was in contact with the lid. If you do that it actually prevents the wisk from spinning at all. You’ll get warm milk, but that’s it….and it may make a funny grinding sound. Slide the rubber stopper back down the shaft that the wisk is on, then slowly slide it up….there is actually a little indent that it is supposed to sit it. And there should be a gap up about a quarter of an inch or so between the stopper and the underside of the lid. Since figuring this out we haven’t had a single issue with our Rivo, and we use it a lot. no they, don’t make reusable cups for the Rivo at this moment. They only make original espresso cups. Sorry. Thanks for stopping by and have a great weekend. Let me know if you need anything else. I had a similar problem with the frother. I fixed it easily. It has to do with the rubber dome shaped stopper on the frother. There must be space between the top of the frother and the stopper. If you push the stopper all the way flush against the frother lid it will not aerate. Good luck! Thank you for stopping by and for the feedback Karen. I really appreciate it! I’ve had my Rivo for a couple of months now and it suddenly won’t froth anymore, and I haven’t found any Rivo blogsite for Keurig Q & A has no answers, can any one help? Hi Robert. One of my readers had this same problem. Luckily, Keurig has a pretty good customer service. so I suggest to give them a call and just say that you’re having a problem with the milk frother. I am sure they will be glad to help. You can find the contact info at the bottom of this page http://www.keurig.com/customer-service . Good luck and let me know if you need anything else. Rivo does have a separate frothing pitcher (it’s pretty similar to those on Nespresso Lattissima machines), so I am pretty sure that you can use this same recipe. However, you should know that adding any other ingredient besides milk (before frothing), like ice, syrup, creamer etc is not usually recommended, because it CAN cause a damage to your coffee machine. Both Keurig and Nespresso don’t recommend this. I hope this helps. Thanks for stopping by. All the best! I also use 50/50 on whole milk and flavored creamer. It gives me a nice froth and flavor. I know the instructions do not recommend it, but I clean it out every time. Then i run a clean water froth cycle afterwards, to prevent any residue. Then I hand dry all the froth components. I honestly think my machine should be fine. What are your thoughts? Do you honestly think that running 50/50 milk and flavored creamer will damage the frother if it is meticulously cleaned every time? Creamers and milk have almost the same texture so it’s not like you’re using sugary syrups, ice cubes or anything. I don’t think it can cause any damage neither. Especially since you’re taking such a good care and you clean the frother thoroughly. I do have to mention manufacturer’s recommendation though. I have never tried the Keurig, but love Lattes and Cappuccinos. I have long been looking for a great machine to have in my kitchen. I might put this one on my short list. Hi Apollo, I am glad you like it. Yes, most Keurig machines don’t make espresso and cappuccinos, this is the first model ever. If you’re looking for a good single serve machine that makes espresso and cappuccinos, Rivo is a pretty good choice. People love this machine, even though it’s relatively new. The CBTL machines are also a great choice especially because they make both brewed coffee and espresso drinks. I hope that helps. Hi Mike, you can make regular espresso – without any milk, but that’s 2.8 oz drink. You can’t make regular 8oz or 10oz brewed coffee like when using k-cups. If you’re looking for a machine to make both espresso and brewed coffee, CBTL machines or Starbucks Verismo are probably a better choice. I have an old Gaggia Classic espresso machine and my own Rancilio grinder but I also like to go by and get Starbucks espressos for the convenience on the way to work. I have been looking for reviews on the Verismo and Rivo machines and really want to try one for quick lattes in the morning without grinding, tamping, etc. Which one would you recommend at this point for the best all-in-one solution, the Verismo or the Rivo? I always get a triple Venti at Starbucks so I presume I would be using multiple pods so I know I won’t be getting much of a cost savings. Thanks for the effort you put into your reviews. wow you have a really good taste. I love Gaggia machines. As far as the Verismo / Rivo, I would probably recommend Rivo. First of all, I don’t really like Starbucks milk pods. In my opinion, fresh milk is really important if we want to make good espresso based drinks. Second, I usually buy Lavazza espresso and I like the fact that Rivo uses their espresso pods. And there is that pod/ packs price difference. Verismo pods – $0.99 per drink, Rivo packs $0.83 per pack. Of course, good customer service is also important and according to my readers, Keurig has much better customer service than Starbucks. These are just a few reasons. I hope this will help a little bit. Thank you for taking the time to stop by and this nice comment, I really appreciate it. If you need anything else, feel free to ask, I will be glad to help. All the best! Oh I love Lavazza espresso too, so that would be a plus with a Rivo. Lavazza Super Crema Whole Beans in the blue bags are one of my favorites to grind myself. sorry for the late response. I am glad that you like the Rivo and I want to thank you for your feedback. As far as this milk frother problem, this is not a cheap coffee machine and you should be able to use it more than 25 times for the price. Rivo comes with the 1 year manufacturer’s warranty and I think it would not be a bad idea to contact Keurig customer service ( you can find contact info here http://www.keurig.com/customer-service ). I hope they will help. Let me know how it went or if you need anything else. Good luck! I just made my first cappuccino. My husband ordered this from Bloomingdales just a few days ago. I saw it so he let me have it before Christmas. Wonderful! I love a kit of froth and it was perfect. I think the lady told my husband we can order more coffee until it is available in stores. If not I will just brew an Espresso in my keurig platinum which I just bought. Both are wonderful. We go to Starbucks every day so these will pay for themselves in no time.